The Pop In is one of the mainstays of the live music scene in Paris. It has been a center for youth culture and a meeting place for almost a generation – well, at least a decade or so. I have had a love-hate relationship with this place as an open mic venue because it is often difficult to get one of the 15 spots available every Sunday night for the open mic. But last night I decided I would do all I could to get a spot for the show, that starts at 9:30 and ends around midnight. So I showed up at 7 PM and signed my name to the list. I got the fourth spot. I have done a little introductory video this time, using my video editing software to link together a few segments to show the neighborhood – where there is a beautiful shot of the Cirque d’Hiver, which I have written about – and especially the very cool piano moment I found in the Pop In on the upper floor while the open mic was going on at the same time. And there were some fabulous acts playing in the open mic too, so I’m putting up a couple of videos of my favorites – although there were others that were also favorites of the evening, but I don’t want to put up too many videos. Here was one of my favorites, a band I have already mentioned in this blog, called, The Rain, with Martin Rain and Julie Hoarau. Sorry the lighting is so bad. On the other hand, I do have one video of me that worked out. It is an absurd, ridiculous, even embarrassing video that I took of myself playing in a new fangled rehearsal space that I created on the nearby boulevard. Thing was, because I had to arrive at 7:00 PM to get my name on the list, I had more than two hours to kill before going on stage to sing my two songs – that’s all anyone gets at the Pop In – and therefore I decided to use the time in two ways. First, I decided to eat dinner in a nearby restaurant. Second, while eating dinner and reading Mojo or Rock & Folk (can’t remember which) I decided that I needed to find a rehearsal space before I played one of my planned songs. Well, just before running out to the Pop In I printed out the lyrics to the Incredible String Band song. But I could not find the song itself or the chords and so I had to try to figure out how to do it from memory. All the way there on the metro I tried working it out in my head, eager to sing it at the Pop In. Finally, after dinner I decided I needed another rehearsal. And that is when I had my absurd inspiration. 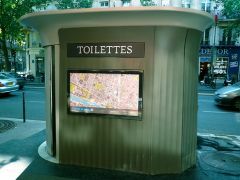 There was, I knew, a nearby new public Paris toilet on the sidewalk of the boulevard next to the Pop In. I knew these new fangled toilets were massive inside and clean and provided the perfect environment for complete privacy. So I decided to go there and play my song. But I also decided to record this moment on my Zoom Q3 as I was certain that I would do a better job of the song in the rehearsal space with no audience but the Q3 than I would live in the Pop In. In fact, as it turned out I was not only correct on that matter but I did not have the courage to sing the song at the Pop In. It was a wise decision, as the quality of my singing and guitar playing on this song I had never played before then was absolutely appalling. However, I am including the video on this page at the risk of embarrassment because it is so absurd, yet true, and finally because there is a surprise ending to the video which I had no idea was coming. A kind of deus ex machina that you have to watch the video to the end to appreciate. For those of you who do not speak French, the voice that came out at me at just the right moment was telling me in French that I had used up all my allotted time in the rehearsal space and the door would open up automatically in two minutes. Still, as it cost no money, it was a great little rehearsal space and I recommend it to my fellow musicians everywhere if you visit Paris.